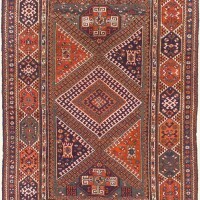 Tribal & Village handwoven rugs from Stephen Miller Gallery of Menlo Park, California. 19th century Turkish beauty. Handwoven from 100% wool and vegetable dyes. 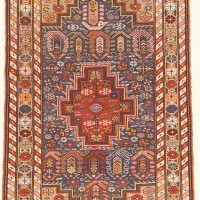 Stylized paisley botehs, stars and rosettes surround a central medallion. Lovely details, primary colors and striking contrasts. Wool on wool warp with totemic quality displayed in festive primary colors. 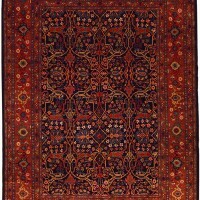 Natural display of natural vegetable dye from Afghanistan with eye-catching visual appeal. 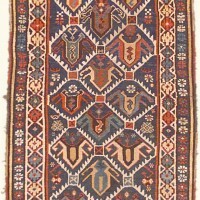 19th Century Garuz design. 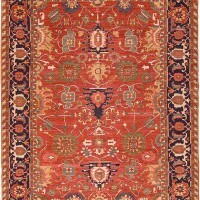 Very finely woven, densely-packed rug over 3 years in production.